Trapper Jack is a local, full service Wildlife Removal, Wildlife Prevention and Wildlife Damage Repair Company specializing in Skunk Trapping and Removal. We Offer Free Estimates and 100% Satisfaction Guaranteed. 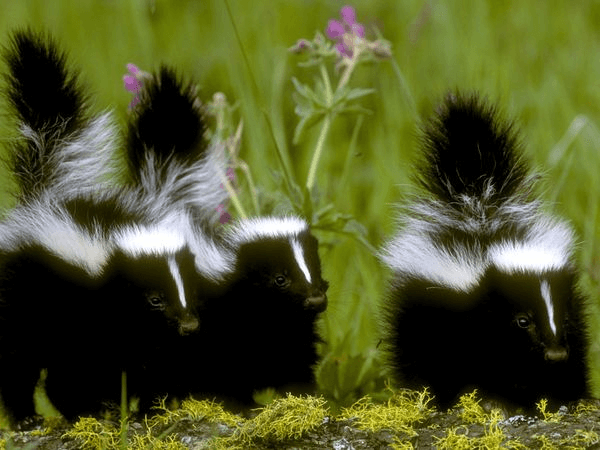 Skunks are usually classified as a pest species due to their odor, and occasionally, digging. Your best bet is to trap the skunks in live cage traps, and relocate them. It's actually pretty easy to do, and safer and more effective than trying to kill the skunks. You may be worried about the skunk spraying you, but it's really easy to avoid that. And just so you know, there is absolutely no skunk repellent spray (ironic!) powder, or device that'll keep them away. But if you trap them and relocate them at least five miles from your property, that should solve the problem. You can either hire a professional to do so for you (laws may prevent you from doing it yourself anyway) and that way you don't have to worry about getting sprayed. If the skunk has fallen down a window well or basement, you can have a pro snare it for you, or you can put a wooden board down the window well, and the skunk should be able to climb out. Of course, you can help prevent skunks from using your property. They are often drawn to live under crawl spaces, decks, porches, sheds and such. You need to install an exclusion barrier around the perimeter of the deck, so that they can't crawl under. And of course, don't leave out pet food, or any other food that will attract skunks.